Pop the date in your diary, and gather a group of friends to enjoy the evening with. Our AGM will be at 7.00pm, followed by Austen's Women at 7.30pm. 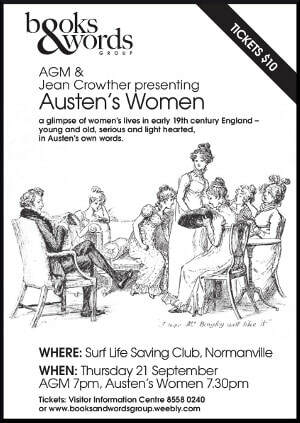 Following the formal part of the meeting, Jean Crowther will be presenting “Austen’s Women”. Her presentation will be in Jane Austen’s own words and provide a glimpse of women’s lives in the 19th Century. It will be both serious and light hearted. The bar will be open for purchasing of your own drinks, and some supper provided.